Home > Pets > Dog > Dog Food > How Raw Food Diet for Dogs Can Be Helpful? The food that your pet dog eats should provide all the nutritional components that are essential for healthy development of all organs and systems. Proper nutritional compounds can help with the proper functioning of the body and prevent diseases from occurring. Before starting raw food diet for dogs, you should consult a veterinarian to confirm whether you can give raw food to your dog or not. It is a good choice to give homemade diets, but it might be tough to prepare and maintain over the time due to the cost and ease of cooking ingredients that lead to recipe drift. 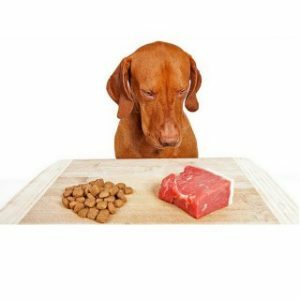 Meat is the main ingredient to include in the raw food diet for dogs. Meat should be included daily in your pet dog’s diet. Initially, you can start with raw chicken, then you can feed the dog with some other types of meat such as fish, lamb, pork, turkey, rabbit, quail, etc. You can add bones and other organs like liver, kidney, heart, etc. Most people think that dogs are carnivorous, so they should not be fed with vegetables and fruits. But they are omnivorous like humans and you can safely feed your dog with fresh fruits and vegetables. You can add fruits like apples, oranges, pears, etc. You can add vegetables like carrots, peppers, parsley, celery, and spinach. Also including foods like raw eggs, cottage cheese, yogurt, etc. occasionally is a good idea. Also, you can find raw food diet for dogs at various pet stores. But, avoiding these foods is a good idea as they are prepared under unhygienic conditions. Some of the readily available products may contain additional supplements that can harm your pet dog. Are there any health benefits of raw food diet for dogs? Most of the dog owners who used raw food diet for dogs reported many positive changes. Raw diet is more balanced and provides all the necessary nutrients for good health of the dog. As the animal bones are the main thing in raw diet, they help in cleaning the dog’s teeth in a very natural way and make the gums and teeth stronger. Raw diet aids in proper digestion thus leading firm stools. Dogs that usually eat raw foods look more energetic and lively than the dogs that do not. As raw diet includes several food items, dogs will enjoy them while eating, which in turn will bring huge difference in their appetite. Raw diet helps in controlling dog’s weight from excessive weight gain or excessive weight loss. Raw food helps in the development of healthy skin and healthy coat. This diet makes the dog’s immune system stronger thus preventing it from many diseases. Studies suggest that dogs that eat raw food can live a longer and healthy life.